Are you ready for a little Remarketing 101? If you’re responsible for generating leads and sales, this is something you should know because remarketing gives you more bang for your marketing buck. Have you ever been searching for something, you come across a website that looks interesting, but then you get distracted and close the browser window — only to find that you are being followed by the website’s branding or ads on various other sites you visit? That’s called “remarketing” or “retargeting.” It’s another step forward in digital advertising’s trend to personalize search marketing and advertising, and to bring value to both advertisers and buyers. It didn’t occur because of some stroke of luck, or a case of a coincidentally large advertising campaign. Remarketing is not expensive. It a useful tool because it helps you stay in front of people who have visited your website with a small display ad (1) keeps you top- of-mind, and increases (2) the likelihood your prospect will eventually become a customer. Remarketing works by building a list of prospects through an insertion of a small bit of code onto your website. The code tracks prospects that have visited your site and places ad’s on websites throughout Google’s Display Network, or if you use Perfect Audience or AdRoll your banners follow web visitors thru Mobile, Web, & Facebook. The user can then click on your ads and return to your landing page. These are not expensive; maybe $0.75-$1.00 if they click on it. You can even extend your ad with a phone number or with sitelinks. What Types Of Banner Ads Work Best? If you’ve created a marketing funnel on your website, goal should be to get your prospect into the top of your funnel with a your lead magnet. 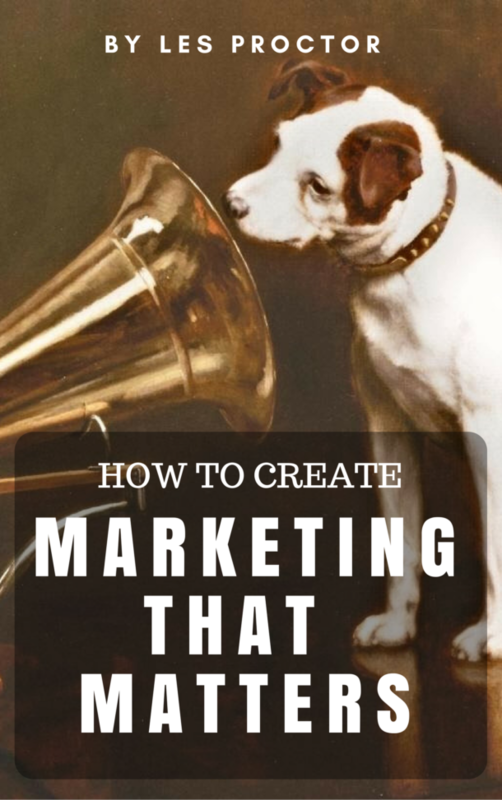 If you don’t have a lead magnet yet, you’ll need to create one. It could be something as easy as a Free Consultation or it could be a Free e-Book. My lead magnet, the one I use on this website is called: “The Growth Blueprint“. So for the purpose of illustrating this I’ll create some banners for my e-book. Since these banners will be displaying in “the channels”, i.e., off your website, the creative should emphasize the problem with just the promise of the solution. When you use remarketing to emphasize your brand, you’re not helping anyone, much less yourself. If you’re going to remarketing, you want to emphasize your customer’s problem, and then bring them back to the website. When they click back through to your site. Your site should affirm their worldview, and reiterate the problem. Again with a promise of a solution. Just enough to whet their appetite and get them started into a marketing automation campaign that teaches them about the benefits of your offer. Done correctly, the marketing automation and the content you provide your prospect does much of the selling for you. To maximize your exposure you should create give (5) web banners: 300 x 250, 728 x 90, 160 x 600, 468 x 60, and 120 x 600. Again you follow the Problem Aggravation Solution (PAS) formula. Keep the copy very simple. It should include the problem with a promise of a solution. So I wrote 10 headlines with a call to action. Remember some of these banners are small, so keep the copy to a minimum. These are all ideas that I can create banners for, and test down the road, to see which one works best. Google Remarketing works on The Google Display Network which is very large. And this is great for entry level remarketing. Perfect Audience lets you bring all your retargeting together into one powerful dashboard. Setup takes minutes. See results immediately. Try it today and get a $100 credit. A typical e-commerce conversion rate is 2%. What are you doing about the other 98%? AdRoll’s retargeting technology lets you reach out to past site visitors and bring them back to complete a purchase. So that’s my primer on Remarketing. If you want to appear larger than you are, or really start getting some bang for your marketing buck, you should consider it. If you need help setting one up, just contact me. How about you? Have you ever used Remarketing? What’s your experience been with it?